Volunteers like Mary and donors like you keep our clients from being depressed and isolated. Mary and her husband, Chuck, have been delivering meals for over 30 years. They started through their local church. Chuck was one of MOW’s original delivery van drivers through Presbyterian Hospital. The Bejceks moved here in 1980 from Midland, Texas, where Chuck was a meteorologist at the airport. 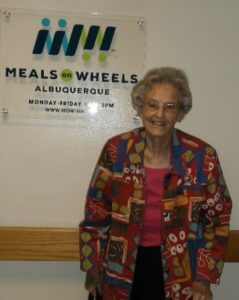 Mary worked as a Crossing Guard for 19 years in Albuquerque. She was 10 when Pearl Harbor was attacked, and she remembers her entire family having to conserve. Worried about air raids, her father would go around the city, making sure all the lights were off. Her mother came from a big family, and several of her aunts were teachers. Mary’s eyes twinkle when she talks about how they would ask her during Sunday dinner how she was doing in school. “I was average,” she laughs. Mary went to Bowling Green State University for two years. By that time, she and Chuck were married. They have three children and have been married over 60 years. An avid bowler, Mary is humble when asked if she is any good and emphatically responds, “No, not anymore!” Are you convinced? We know we won’t be placing any bets against Mary any time soon! Thank you, Mary, for nurturing our clients with your passion and kindness.